�Janet�s dedication to patients and their families is breathtaking. This book is a reflection of the spirit that drives her on a daily basis. Janet has helped me to believe in Angels. This is a book you will read more than once.� --Greg Thome, President/CEO of Hospice of America, Inc.
Joy is a word rarely associated with death. 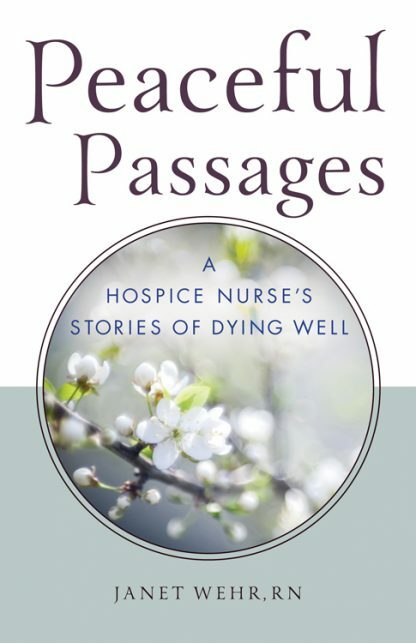 Yet joy is ultimately the effect in this collection of stories about Janet Wehr�s experiences in witnessing the death of her patients during her fifteen years as a hospice nurse. Her first-hand account gives illuminating and comforting insight into the spiritual aspect of what occurs in the transition between life and death, highlighting the importance of the mind-body-spirit connection as it manifests in the dying process. It also gives a candid impression of hospices and hospice nurses and the services they can provide. All of Janet�s forty-six personal stories are true, fascinating, heart-felt, and thought-provoking. Through her authentic examples, readers gain understanding, hope, and a sense of peace about what is, after all, an inevitable experience for us all. And with that sense of peace, comes joy. This book is endorsed by the President of Hospice of America and will be used as a training manual by that organization. Janet Wehr, RN, QTTP has been a registered nurse for 22 years and has devoted the last 17 years of her nursing career to hospice care. She has been actively involved in the healing modality of Therapeutic Touch for over 20 years and is a Qualified Therapeutic Touch Practitioner. She is a member of the Therapeutic Touch International Association and the American Holistic Nurses Association and is on the Board of Directors for Saret Charitable Fund of DuPage County, IL.